The newest film from the director of Napoleon Dynamite is much like its predecessor, which is to say it’s weird. That sounds harsh, I know, but there’s no getting around it. It’s just weird. Bizarre. Kooky. A little out there. And I hate to admit that because I really wanted this film to be great. I really did. I mean, the director is a Mormon, for crying out loud. He went to BYU, my alma mater. And film directors from BYU are few and far between, let me tell you. When a good one rolls around, you want him to achieve every success and honor. 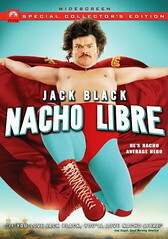 But Nacho Libre is just a little too wacky for my tastes. I can’t, in good conscience, give it a glowing review and recommendation. And the sad part is, the movie probably isn’t to blame. What’s more likely is that I’m not cool enough to get it. This isn’t to say the film is without merit. It has many things going for it. For starters, it’s got a PG rating. (BRAVO!) The cinematography was great. Jack Black was cute and cuddly in a way that most overweight men can only dream to be. Plus he’s funny. And I mean dang funny. I laughed quite a bit. Jack Black has a face for everything. He can elicit a laugh for something as simple as revving the engine on his motorscooter. But he also left me a little wanting. Sure, he’s a monk with a big heart who loves orphans and professional wrestling. But he’s also a bumbling idiot who smears cow manure on his partner’s face. I had a hard time seeing past that. Maybe I have to watch it again. It took two viewings for me to like Napoleon Dynamite. The first time I saw it I hated it. B-.